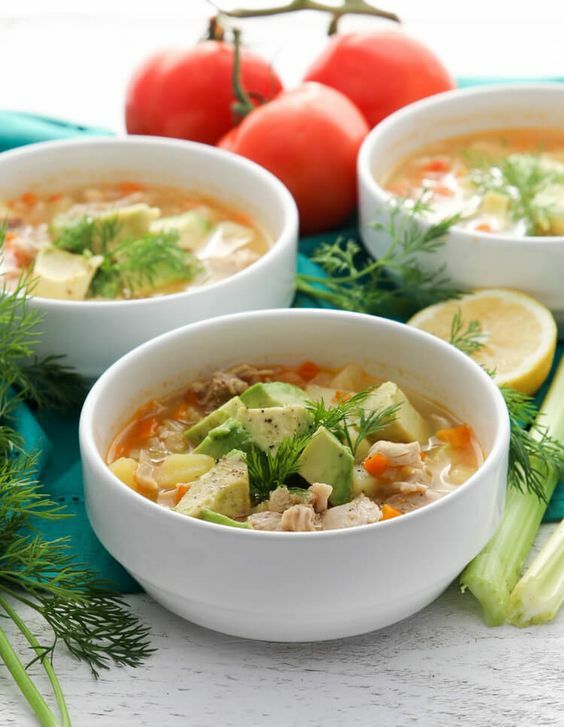 With this delicious avocado chicken soup, you can lower the calorie intake from a traditional chicken noodle soup by substituting the noodles with avocado. You will still have a great chicken soup flavor, but with a gluten-free and low calorie soup. Plus, avocados are good for you by providing healthy fats and the chicken provides lean protein! Boil 1 pound of chicken thighs with 1 teaspoon of salt in 6 cups of water for 30 minutes. Drain water from the chicken into a bowl, then set aside. In the same pot, heat up 2 Tablespoons of olive oil. Add chopped onion, carrots, and celery. Sauté for 5 minutes, stirring occasionally. Add minced garlic, chopped tomato, and chopped potato. Add the water from the chicken back to the pot. On medium heat, boil the vegetables until the potato is soft. Shred chicken thighs and add them to the pot. Salt and pepper to taste. Add chopped avocado to each bowl and garnish with dill before serving.